Dr. Michael Martin, Dr. Elliot Marseille, and Dr. Juliana de Fatima da Silva served as keynote speakers. In early April, the International Training and Education Center for Health (I-TECH) conducted a five-day workshop on “Antiretroviral Drugs for Epidemic Control” for more than 50 chief doctors and deputy chief doctors from Regional AIDS Centers in Ukraine. Dr. Juliana de Fatima da Silva, Epidemic Intelligence Service Officer at the CDC. The pool of facilitators also included nine national experts from the Ministry of Health’s Center of Public Health (CPH). The workshop aimed to support the development of efficient strategies to achieve the UNAIDS 90-90-90 goals: 90% of HIV-positive people know their status, 90% of those are on treatment, and 90% of those are virally suppressed. To this end, the workshop covered national situational analysis, national clinical recommendations, and service delivery models with the highest potential for adaption in country. Progress on ART optimization in Ukraine was shared, and participants were able to discuss their experiences and ideas for improving HIV-related services. 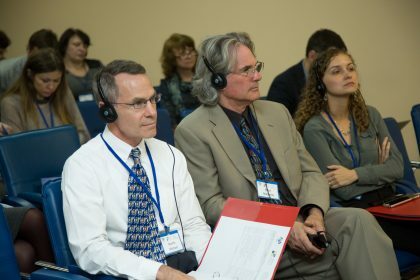 The presentations and group discussions were particularly timely, given the development of complex new HIV clinical guidelines currently under way in Ukraine – they also provided much needed evidence to support this process. Similar workshops were requested by the CPH and leaders of the Regional AIDS Centers, and I-TECH plans to meet this request by conducting two workshops in June and September 2017. THIS PROJECT IS SUPPORTED BY THE HEALTH RESOURCES AND SERVICES ADMINISTRATION (HRSA) OF THE U.S. DEPARTMENT OF HEALTH AND HUMAN SERVICES (HHS) UNDER U91HA06801, THE INTERNATIONAL AIDS EDUCATION AND TRAINING CENTER (IAETC). THE CONTENT OF THIS POST IS THE AUTHOR’S AND SHOULD NOT BE CONSTRUED AS THE OFFICIAL POSITION OR POLICY OF, NOR SHOULD ANY ENDORSEMENTS BE INFERRED BY HRSA, HHS OR THE U.S. GOVERNMENT. © 2019 University of Washington I-TECH. All rights reserved.